Brand new variety show times on ONE! 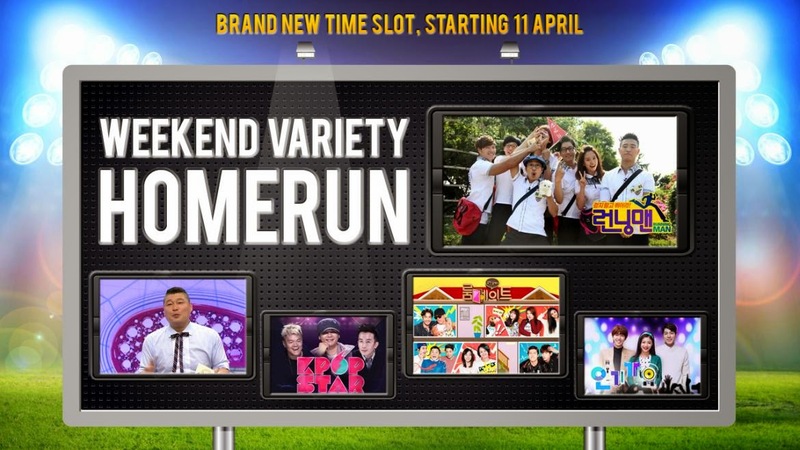 Starting this weekend 11 Apr 2015 (Sat), fresh episodes of all our hit variety series such as Running Man will premiere on the weekends! Airs every Sunday at 8.30pm. The repeat of the new episode will air on Fridays at 11.45pm. Airs every Saturday at 7pm. The repeat of the new episode will air on Mondays at 11.45pm. Airs every Saturday at 8.30pm. The repeat of the new episode will air on Tuesdays at 11.45pm. Airs every Sunday at 7pm. The repeat of the new episode will air on Wednesdays at 11.45pm. Airs every Sunday at 10.15pm. The repeat of the new episode will air on Thursdays at 11.45pm. Catch all past episodes of Running Man on this special re-run. Airs every Saturday at 10.15pm, 2 episodes back-to-back.